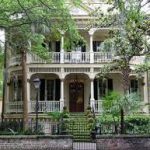 Savannah, a coastal Georgia city, is a charming Southern escape where period architecture, art, trendy boutiques and ghost stories, manufactured parks, horse-drawn carriages, cobblestoned squares are all set under a veil of Spanish moss. Oh, and the oak trees, of course you’d think of the magnificent oak trees. Savannah is a place where cuisine comes straight from the coast and cocktails are served at every meal. Think of Savannah and your mind goes into relaxation mode floating free and easy. General James Edward Oglethorpe was sent by King George II to the American colonies to create a buffer south of the Savannah River to protect the Carolinas from Spanish Florida and French Louisiana. On February 12, 1733,General Oglethorpe and settlers from the ship Anne landed at Yamacraw Bluff. The city of Savannah was founded on that date, along with the colony of Georgia. In 1751, Savannah was made the colonial capital of Georgia. By the outbreak of the American Revolutionary War, Savannah had become the southernmost commercial port in the Thirteen Colonies. British troops took the city in 1778 and did not leave the city until July 1782. Savannah was the Confederacy’s sixth most populous city and the prime objective of General Sherman‘s March to the Sea. Early on December 21, 1864, local authorities negotiated a peaceful surrender to save Savannah from destruction, and Union troops marched into the city at dawn. Savannah was named for the Savannah River, which probably derives from variant names for the Shawnee, a Native American people who migrated to the river in the 1680s. These Shawnee, whose Native name was Ša·wano·ki (literally, “southerners”), were known by several local variants, including Shawano, Savano, Savana and Savannah. Another theory is that the name Savannah refers to the extensive marshlands surrounding the river for miles inland, and is derived from the English term “savanna“, a kind of tropical grassland, which was borrowed by the English from Spanish sabana and used in the Southern Colonies. 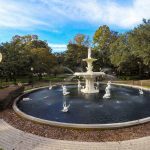 Visit Forsythe Park where you’ll find a cafe, a visitor information center, two memorials, a Fragrant Garden for the Blind and two playgrounds to accommodate children of all ages. On Saturday mornings, a lively Farmer’s Market takes over the south end of the park. Take the Old Town Trolley Tour so you won’t miss all the excitement that Savannah has to offer! And since it works great on mobile devices, you’ll have all the information you need during your trip, right in your pocket. Visit the Tiffani Taylor Gallery on Whitaker Street where you’ll find a thrillingly warm and bright gallery full of original paintings, lifestyle products and pottery, all of which are created by the talented Tiffani Taylor. Taylor’s art can be found in galleries throughout the world, and she has a global following of collectors including Oprah Winfrey. Taylor is the founder of the Savannah Art Walk, a walking monthly tour of Savannah’s galleries. During the Art Walk, participants are able to view art, meet the artists behind the works and sip wine along the way. Eat at The Grey, a former Greyhound Bus Station turned restaurant, which serves a menu full of surprising culinary creations. This highly-acclaimed restaurant offers up elegant fare in a surprising environment. Don’t have time for a full meal? The Diner Bar at The Grey offers a more casual – but equally enjoyable – experience. Catch The Dot, the city’s free express shuttle that runs continuously throughout the downtown area. Want to explore by bike? Try out the city’s bike sharing system, bring your own bicycle, or rent one with the help of Savannah on Wheels! You don’t have to be religious to enjoy Savannah’s sacred places. With breathtaking beauty, deep histories and plenty of photo-ops, Savannah’s sacred spots are often at the top of travelers’ must-do lists. 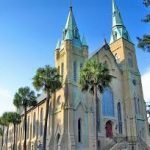 Tour Savannah’s most iconic churches like First African Baptist Church and the Cathedral of St. John the Baptist (pictured) or step inside Congregation Mickve Israel to experience one of the oldest Jewish congreations in America. Consistently named one of the “world’s friendliest cities” by Condé Nast Traveler readers, this coastal town has a world-class reputation for hospitality and grace. Come and discover the enchanting soul of Savannah. 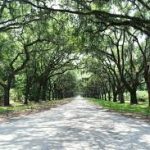 Picture sources: savannah.com, vogue.com, ideal-living.com, tripadvisor.com, ghostcitytours.com, cntraveler.com,bostonmagazine.com, and vacationsmade easy.com.